Montgomery City Hall is located at 103 North Perry Street, Montgomery, AL 36104; phone: 334-241-4400. Photo: Stay House, ca. 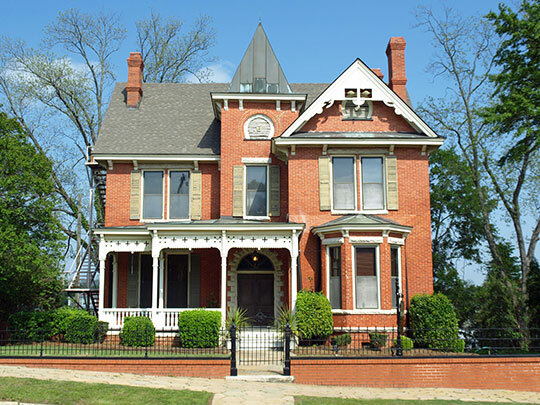 1890, 631 South Hull Street, Montgomery, AL. Listed on the National Register of Historic Places in 1979. Photographed by User:Spyder_Monkey (own work), 2009, [cc-by-3.0 (creativecommons.org/licenses/by/3.0)], via Wikimedia Commons, accessed August, 2015. Montgomery was incorporated as a city in 1819 and became the state capital in 1846. Montgomery, the capital city of Alabama, was incorporated in 1819. The first settler on the site of the present city was Arthur Moore, who in 1814 erected his cabin on one of the bluffs of the river. In 1815 and 1816 other settlers drifted in, and by 1817 the locality had been visited by many enterprising home-seekers. The lands of Montgomery County were put on sale at Milledgeville, GA in 1817. The lands in the immediate vicinity of the present city were purchased by a number of enterprising men, who foresaw the advantages of the location. Among these were Andrew Dexter, who founded "New Philadelphia," George R. Clayton and associates who founded "East Alabama," and General John Scott and associates who founded the town of "Alabama." These rival villages grew apace until 1819, when New Philadelphia and East Alabama were incorporated under the name "Montgomery." Alabama town was added at a later time. Thomas McAdory Owen, LL.D., History of Alabama and Dictionary of Alabama Biography, Volume II, The S. J. Clarke Publishing Company, Chicago, 1921.